Assembled desk after removing the finish I am currently in the process of applying the finish to the Renaissance Revival bed that I have been working on and have decided to hold off on showing photos of the project until I have photos of the completed project. With this in mind I thought it time to write my first post on the Renaissance Revival secretary desk that is a companion to the bed. 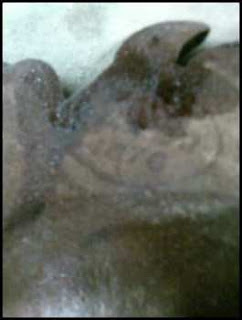 It is obvious that both pieces belong to a set and were made by the same manufacturer in the same time period. 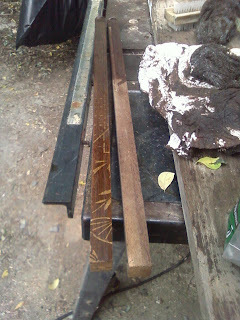 I have learned some additional things concerning these pieces as a result of removing the finish from the desk. 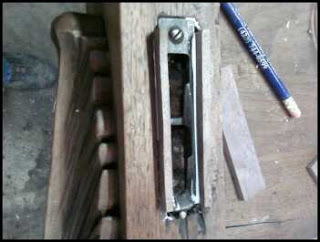 the first is that the joinery work was still created by hand. This was a time that saw the mechanization of many things once done by hand, but there are several element of these pieces still created by hand. The second thing I noted is that these pieces have definately been worked on previously and that the finish is by no means original. 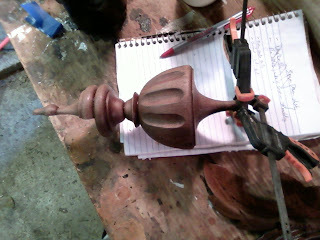 The finish that would have been used on pieces like these originally would be a French polish. 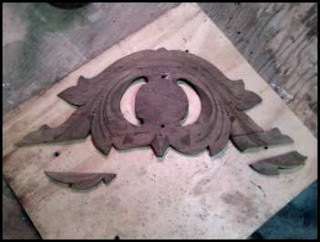 This is the finish that I will be putting on the pieces. 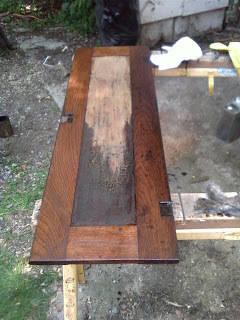 The Desk is made primarily of Walnut with Poplar as a secondary wood. 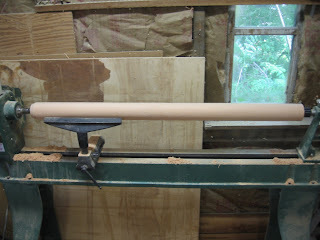 The use of poplar means tha this piece was made south of Pennsylvania since Poplars do not grow in northern climates enough to use as a secondary wood. 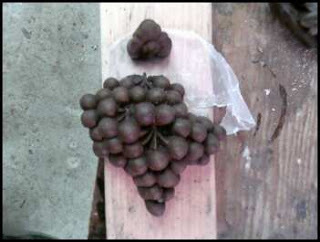 In the north pine is traditionally used as a secondary wood. 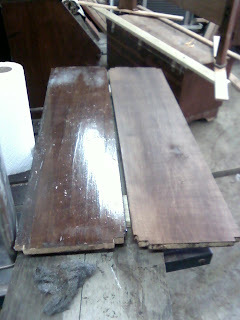 A shelf with the finish removed next to one with the finish intact. 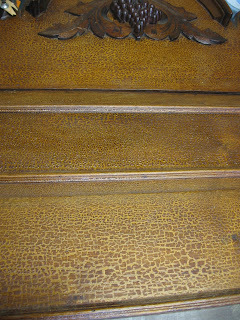 Repairing a crack in the finial Removing the old felt from the writing surface The writing surface with the felt removed and the finish removed from the lid Two drawers before the finish was removed A close up of the crackled finish on one of the drawers A view of the side of the desk before the finish had been removed. A close up on the side of the desk These are the supports for the desk lid. 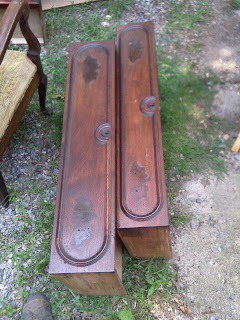 Removing them revealed that the one on the left came from another piece of furniture. 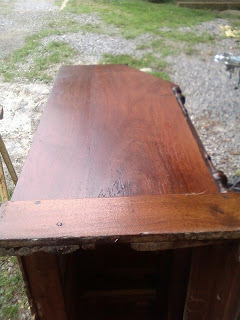 My feeling is that this is not original and that when repairs were made and a replacement support needed, the cabinetmaker used walnut tha was at hand. 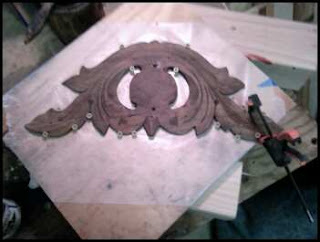 In this case he ripped the piece from a larger baord with finish and gold paint on it. 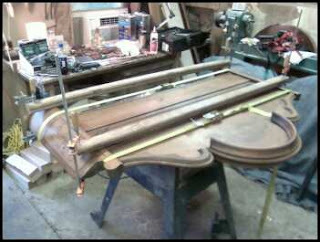 Before getting to the repair work I thought I would share some more information about the bed. 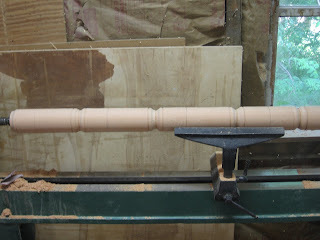 Attaching loose molding to a side rail. 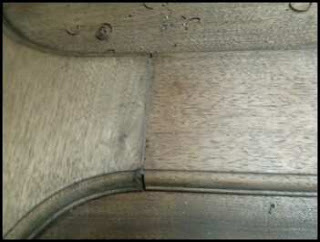 Wedging a gap in the headboard. 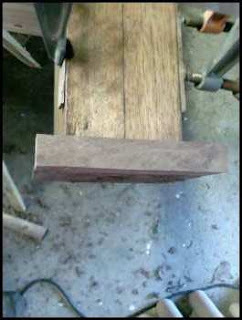 The same wedge after it was carved down. 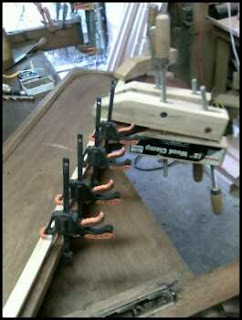 Gluing loose joinery on the foot board. 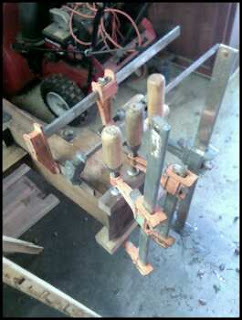 This is a picture of replacement hardware for the bed. The replacement did not fit very well so they nailed the bottom in place so that it wouldn't move. 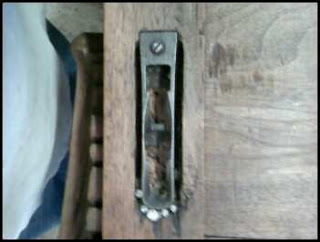 After removing the nails I wedged the gaps beside the hardware to keep it in place. This is structurally more sound as well as looking more attractive. 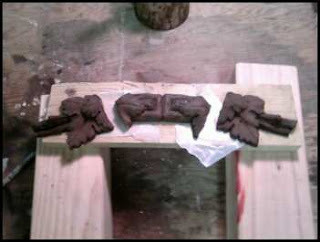 After the glue dried I carved the wedges down so they were flush with the rest of the wood. 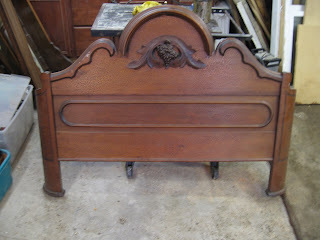 My current project is the restoration of a Renaissance Revival walnut bed. The bed is between the size of a full and queen size bed. 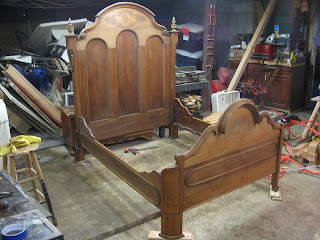 here is a photo of the bed after the finish had been removed. The Renaissance Revival movement in furniture lasted roughly between 1860 and 1880 and came into popularity in America after the civil war. It was part of the larger Victorian era and followed the Rococo Revival Movement (1840-1865). 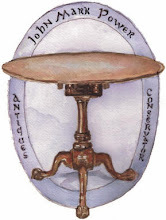 Most people refer to this style of furniture simply as "Victorian" which is understandable seeing as how there were several movements within this era which overlapped, and also that furniture makers seemed to borrow design elements and blend them making it difficult to attribute a specific movement to a specific piece. 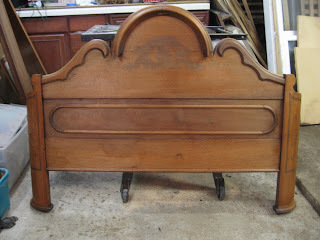 One of the design elements present in this bed is the applied ovolo molding on the foot board and side rails. 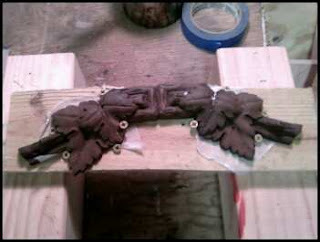 The presence of this molding is a key characteristic of the Renaissance Revival movement. In addition, the overall architectural feel of the design matched with its massive proportion also indicates Renaissance Revival. Rococo Revival tends to have curviness as an overall feel. As one movement transformed into the other, design elements were carried over and utilized often making it hard to pin a specific piece down to one particular style. 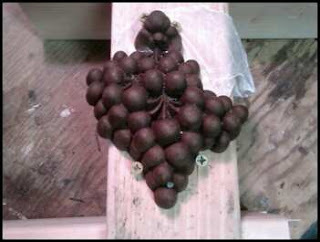 for example, the use of the carved fruit and vine motif on the head and foot board is characteristic of the Rococo Revival movement but is also seen in the Renaissance Revival movement.This bed has enough design elements to place it firmly within the Renaissance Revival movement. 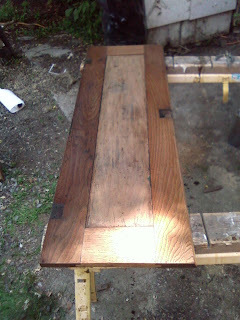 In Some Cases the finish can be sanded down and then re distributed on the wood through the use of alcohol. 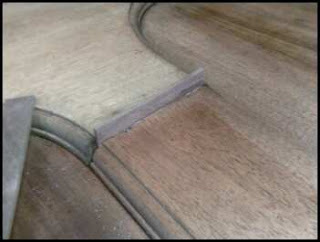 Unfortunately, This finish was so damaged that removing the finish was the better option. 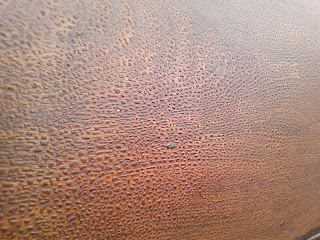 I also saw several indicators on the piece that this was not the original finish. 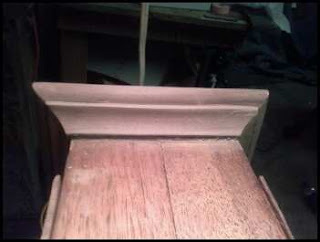 The Fruit and Vine molding are applied to the face of the foot and head board and are actually made from paper or wood fiber. 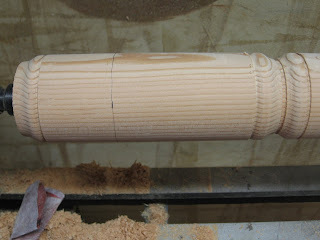 Because of this, care is needed when removing the finish. 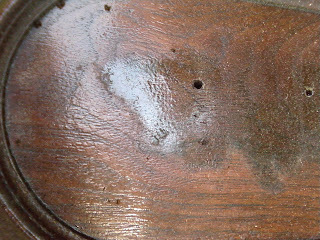 I removed the carvings from the piece for this reason and also to more easily repair cracks in the carvings.Here are some photos of the Foot board before and after the finish. 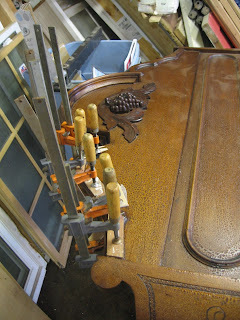 In future posts I will detail the repair and refinishing of the piece. 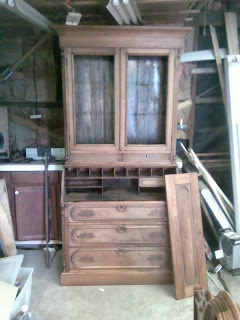 Close up of a larger section with ogee molding. 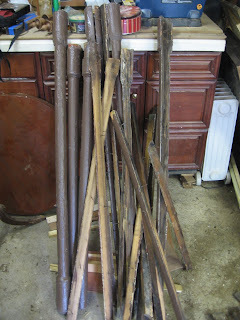 Several of the Larger turned sections with ogee molding. 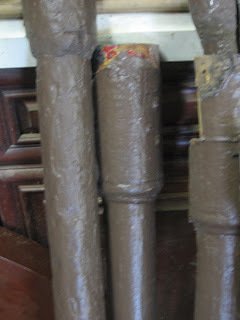 A closeup of two of the sections that will be separated later.